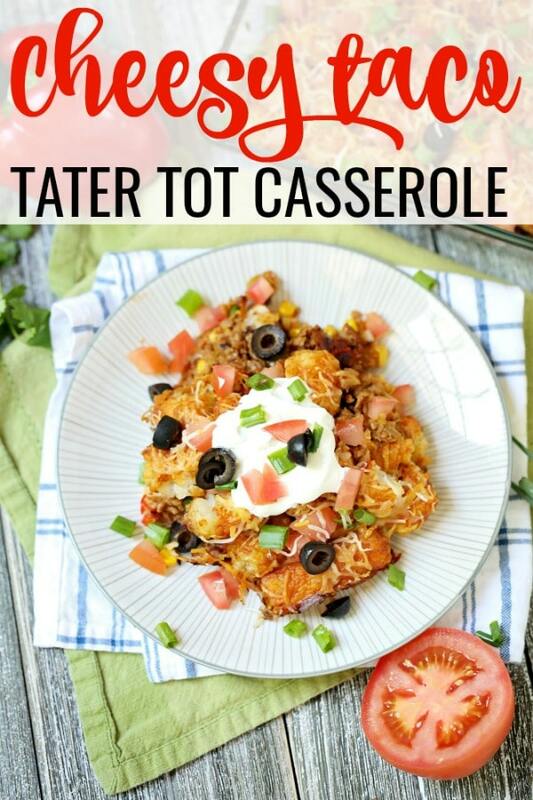 If you’re looking for an easy kid friendly recipe, look no further than this Cheesy Taco Tater Tot Casserole with Ground Beef Recipe. 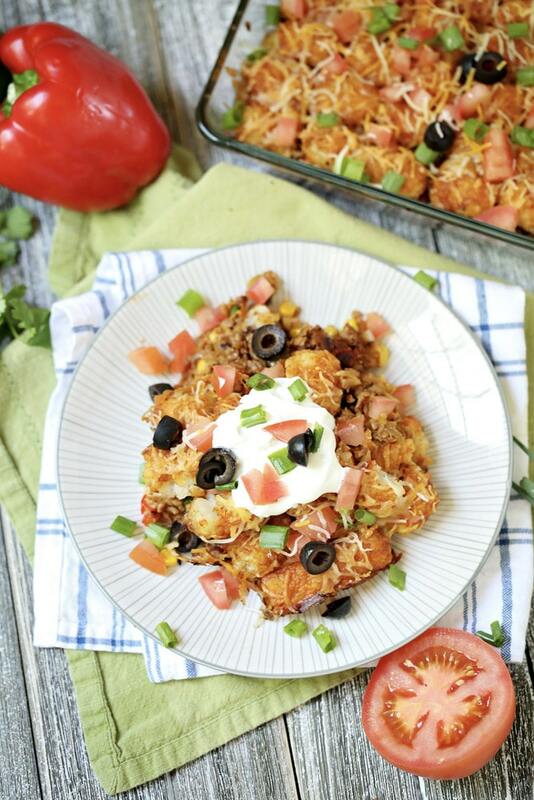 It combines the flavors of your favorite taco to make one delicious hamburger tater tot casserole. 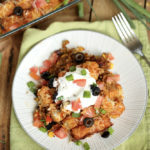 Crispy tater tots, a beef mixture, green chiles, black beans, enchilada sauce, corn, and lots of cheese make this taco casserole! What’s your family’s favorite meal? For us, it’s Taco Tuesday! But you can only have tacos so many times without needing to mix things up a bit. What better way to still enjoy the flavor of tacos than by serving them on top of tater tots?! Tater tots are such a genius potato because you can enjoy them any time of day. 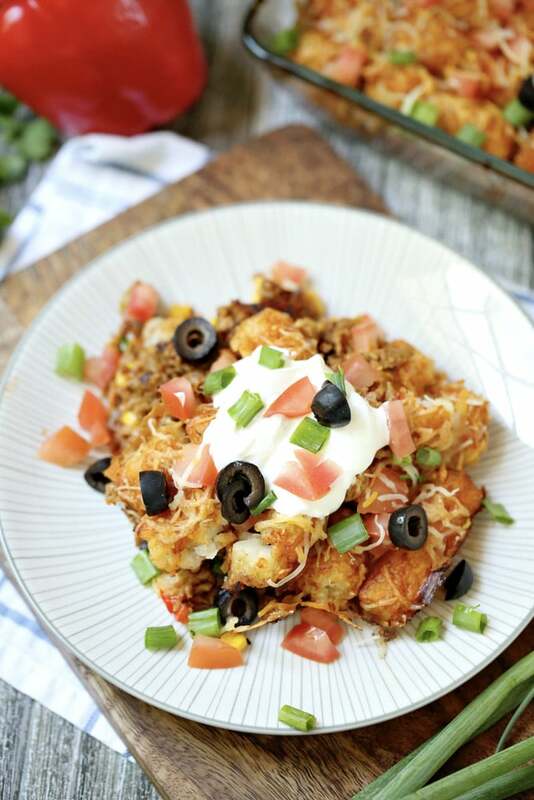 You can have breakfast totchos topped with bacon and eggs, eat them as a side, or have this taco tater tot casserole for dinner! 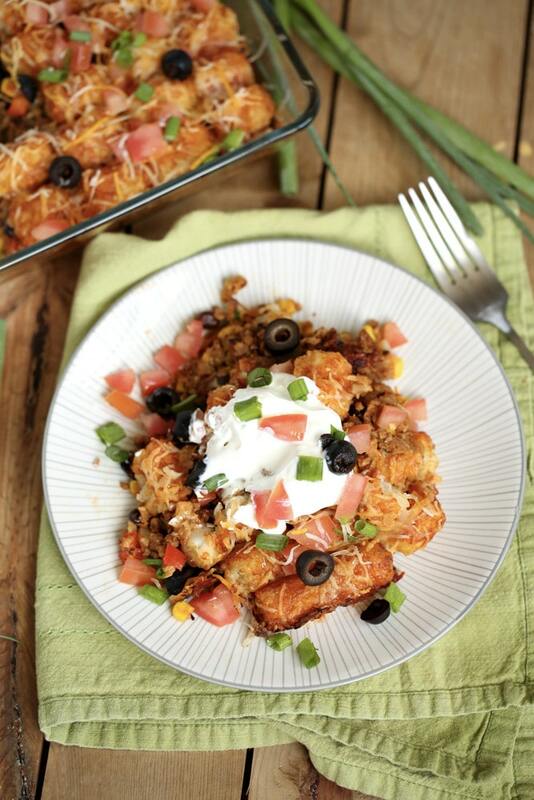 Making this taco tater tot casserole recipe is easy. Start by preheating your oven to 400 degrees. Then, brown the ground beef in a large skillet over medium high heat. Drain any grease and place into a mixing bowl. 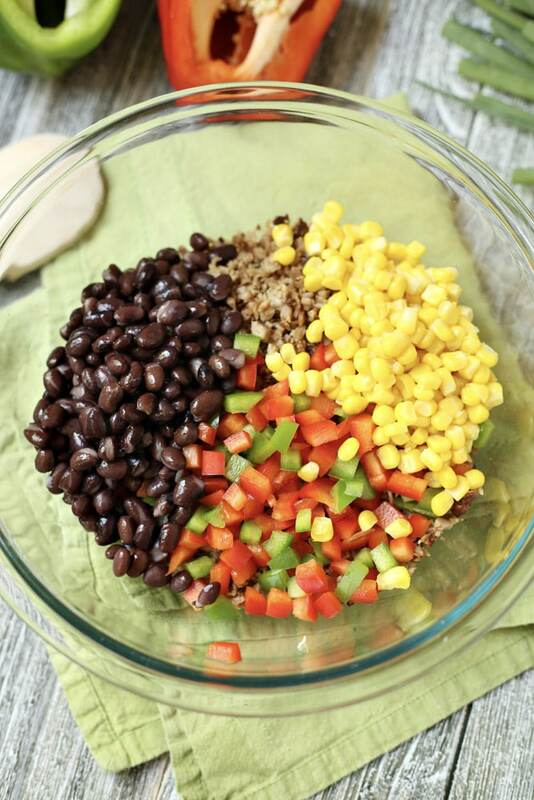 Mix in peppers, black beans, green chiles, corn, enchilada sauce, and cheese until blended. 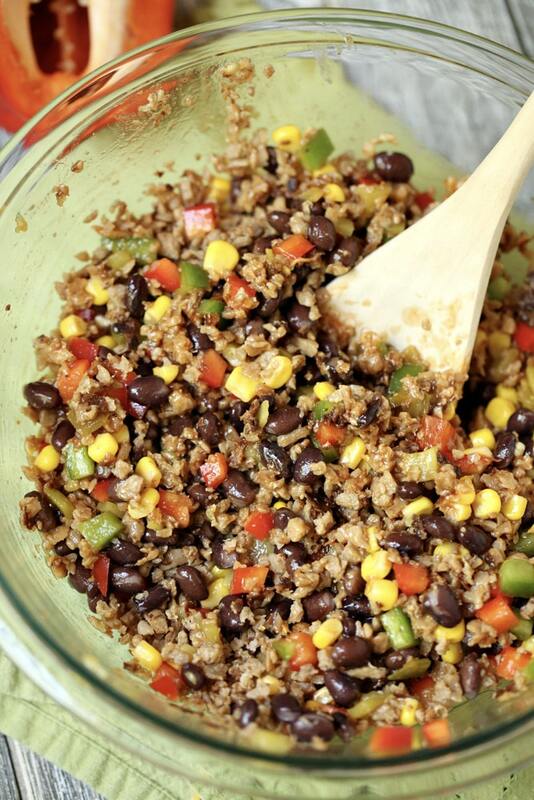 Lightly spray a deep 9×13 baking dish and pour in your taco mixture. 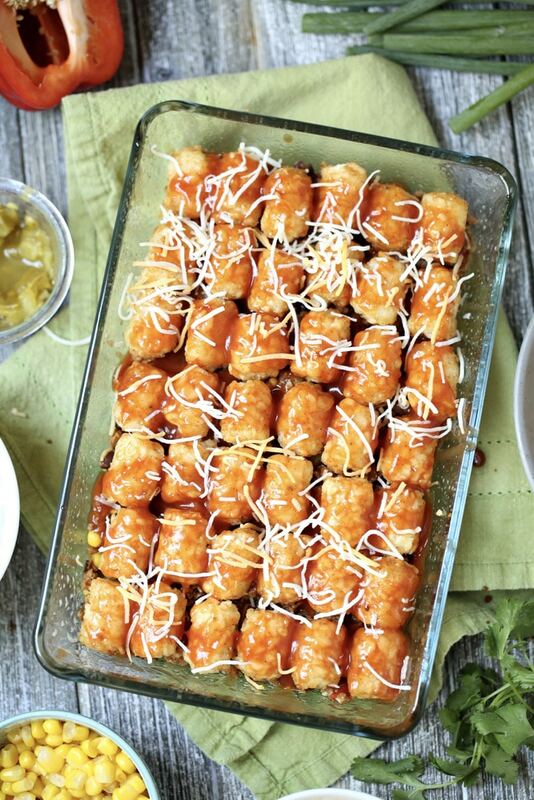 Top with a single layer of tater tots, arranged side by side. Brush on enchilada sauce, sprinkle on cheese and bake uncovered at 400 degrees for 35 – 40 minutes. Serve with all of your favorite toppings like sour cream, diced tomatoes, green onion, black olives. You could also top it with fresh tomato salsa or a homemade guacamole recipe! *Note: for this recipe, I went pretty light on the cheese. But everything is better with more cheese, so feel free to use more! 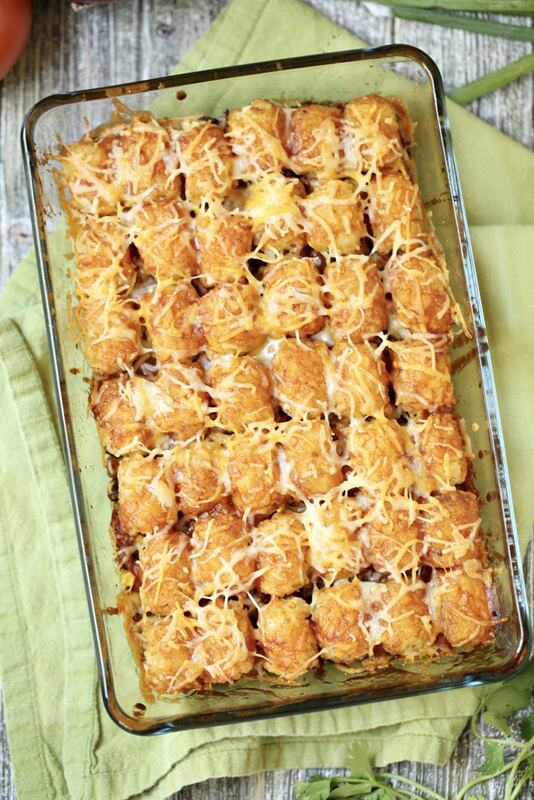 This is such an easy tater tot casserole recipe that the whole family will enjoy! Print out the recipe card below so you’ll have the recipe handy to make on your next Taco Tuesday! 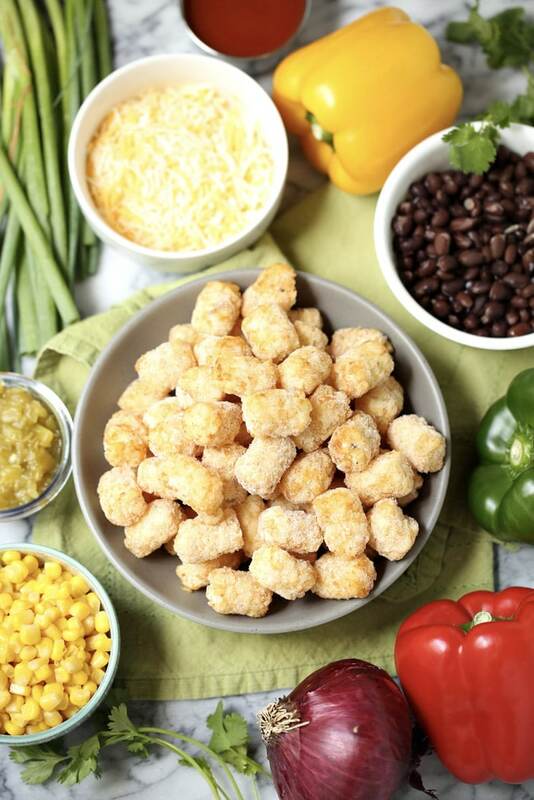 If you're looking for an easy kid friendly recipe, look no further than this Cheesy Taco Tater Tot Casserole with Ground Beef Recipe. It combines the flavors of your favorite taco to make one delicious casserole. 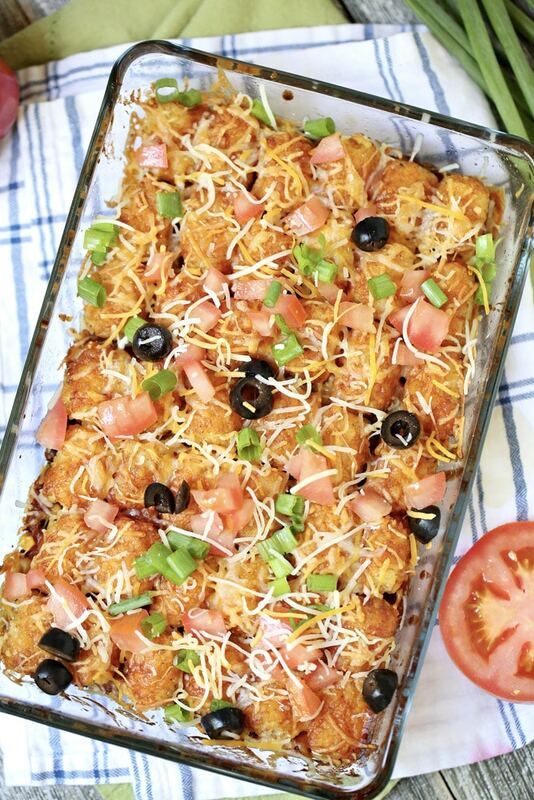 Crispy tater tots, a beef mixture, green chiles, black beans, enchilada sauce, corn, and lots of cheese make this taco casserole! Brown ground beef, drain, and pour into a large mixing bowl. Add in peppers, black beans, green chilies, corn, enchilada sauce, and cheese. Stir to blend. Spray the bottom of a 9x11 or 9x13 inch dish with nonstick, and pour in your mixture. Top with a single layer of tater tots, arranged side by side. Brush on enchilada sauce, sprinkle on cheese, and bake at 400 degrees for 35-40 minutes. Remove from oven, add toppings, and serve. 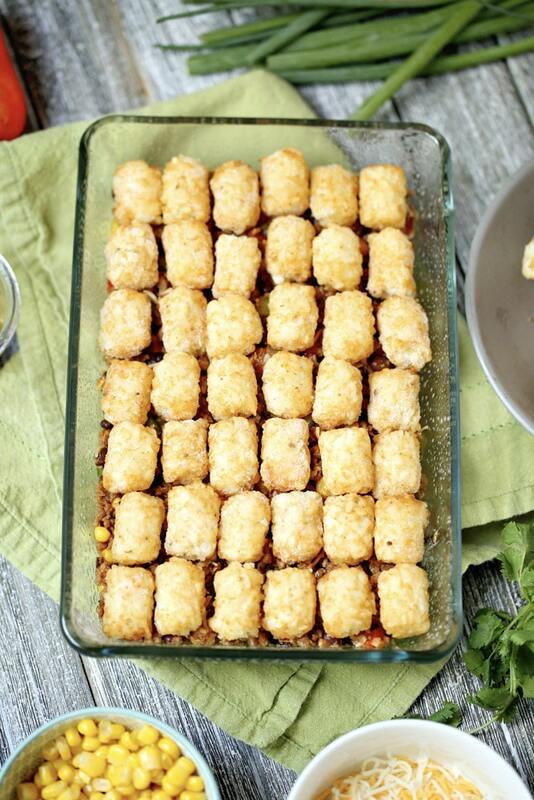 Make sure to pin this Cheesy Taco Tater Tot Casserole with Ground Beef Recipe for later! This has everything I love in one casserole! It’s a keeper for sure! This is my kind of recipe! My family loves it! Awesome recipe! Easy, delicious, and kid-friendly! What a fabulous looking recipe! Pinned & Sharing! Thank you for sharing on Merry Monday! We hope you will join us again next week!